Effects make the graphic visualization less static, and their function is similar to animations. However, they do not reflect the real state of a technological process. We advise using the animations for visualization of a precious technology state and use the effects to visualize the real-time change of objects. The states of objects during animating are based on actual values obtained from the PLC. 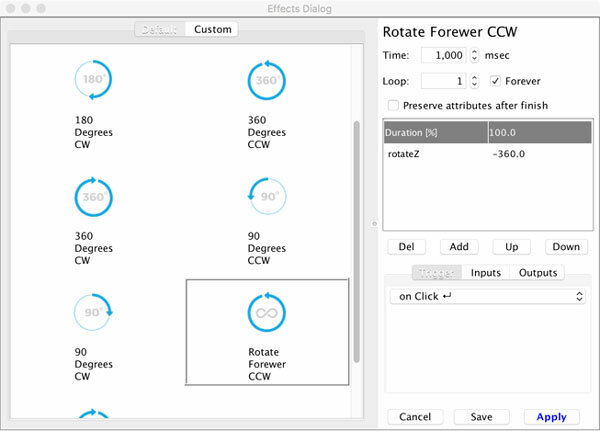 For example, the motor rotation visualized through the Animations behaves according to the values obtained from the PLC, but the rotation visualized with the Effects is based on the values set by you and will use the “hard” data only as a trigger. b. 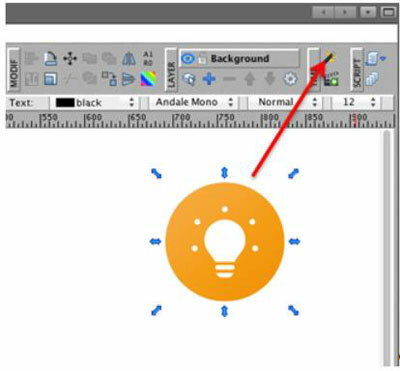 Select the object you want to set effects on and click on the Effects button in the GUI toolbar. 2. A new dialog window will show up. Effects are grouped together into categories. 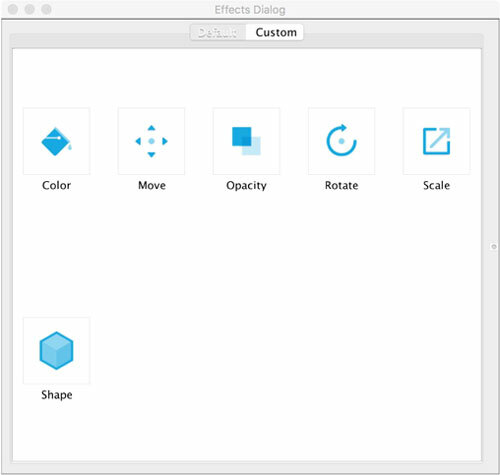 When you open the effects window, you are presented with the selection of those categories. Click on a corresponding category to see all effects under this category. Each effect has its own name; you can change the name of an effect by double clicking on the effect icon. Preserve attributes after the finish: when the effect ends, all attributes changed are reverted to the original state as it was before the effect started. If you would like to preserve attribute changes after the end of the effect, check this option. The mySCADA effects engine enables you to animate different properties for any element. You can change, for example, color, size, move element, and much more. The properties table shows you which properties will be modified when the effect is run. This properties table has just one section and one property change. When this effect is run, it will change the element color to red. 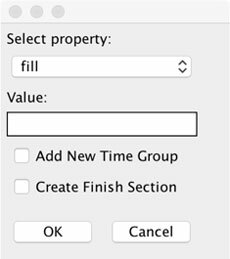 You can change multiple properties at once, or you can change different properties during a time. For example, you can create multiple entries per section (Duration), and you can have multiple sections. The following properties table will show how to change multiple properties at once and have multiple sections. 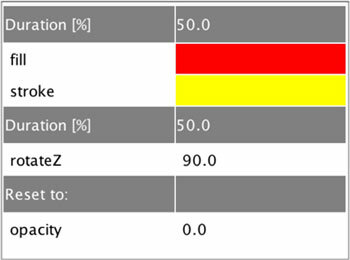 In this example, the fill and stroke color of output elements will be changed to red and yellow. The change will take time in first half of time (Specified by Duration 50.0 %). Then, the element will start to rotate and will rotate by 90 degrees. At the end of the effect, the element will disappear; this is due to the “Reset” section where we have specified opacity = 0.0. Time: this is the duration of the time section shown as a percentage. If you specify the overall time of effect to be 1000 milliseconds and then set the time duration to 20 %, the animated change will take exactly 200 milliseconds. 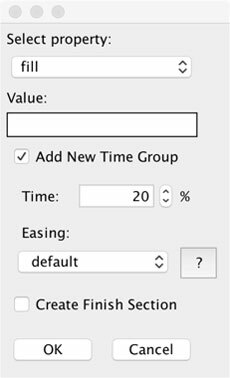 Easing: specifies the rate of change of a parameter over time. 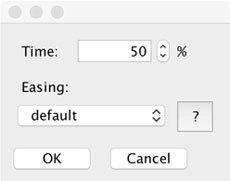 You can choose from several easing functions. To see them all, click on the ? button next to the easing combo box. Select a property you would like to add and set its value. Time: this is the duration of the time section shown as a percentage. For example, if you specify the overall time of effect to be 1000 milliseconds and then set time duration to 20 %, the animated change will take exactly 200 milliseconds. The Finish section is useful if you would like to set some properties for a given value at the animation end. If you use the Finish section, you should check “Preserve attributes after finish”. A trigger specifies how an effect will be started. on Down Up – effect will be activated when the object is pressed and stopped when the object is released. 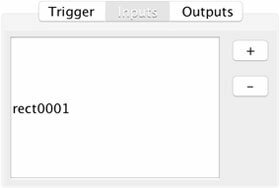 Tag – effect will be activated when selected tag value reaches given range and stopped when the value is out of range. 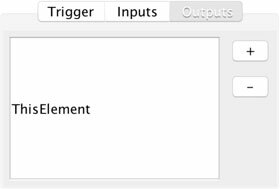 Tag Trigger – effect will be activated when selected tag value reaches given range, but the effect will NOT be stopped when the value is out of range. 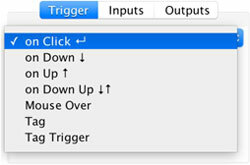 If you select Tag or Tag Trigger from the trigger menu, set the tag address and the range of the Min and Max values. 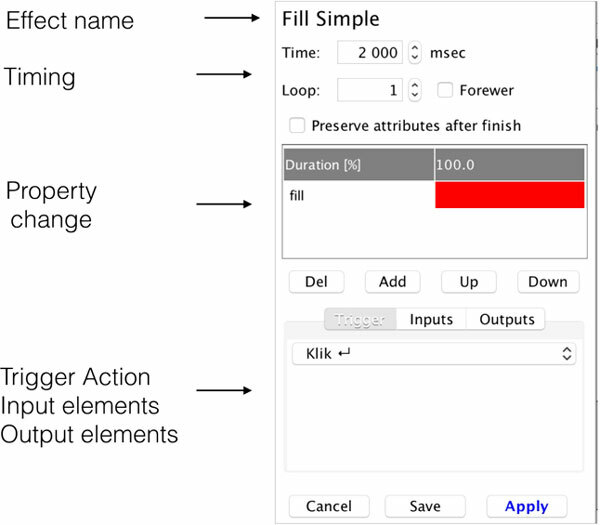 The Inputs section specifies the elements that trigger the effect action. 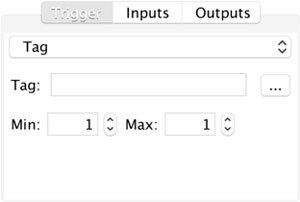 If you, for example, set the action to on Click and then specify multiple Input elements, any of them will act as a trigger effect when a user clicks it. The “+” and “-” buttons allow you to add or remove Input elements from the list. The Outputs section specifies the action elements to which the effect is applied. Usually, you want to apply an effect to the same element you have for the action trigger. In this case, you can leave the default settings as “ThisElement.” If you want to have different or multiple elements, use the “+” and “-“ buttons to select the corresponding elements. 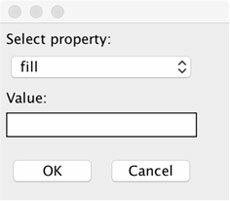 If you have modified effect properties and would like to save them for later use, press the “Save” button. If you would like to set/apply an effect, press the “Apply” button.